SAN FRANCISCO — Usually when commercial fisherman Ed Tavasieff pulls his traps out of the cold San Francisco Bay, he’ll find healthy pink starfish clinging to the sides of the cages, the tips of their legs occasionally nibbled by crabs. But when he picked starfish off his nets two days ago, their lifeless bodies crumpled in his hands. What Tavasieff, who fishes anywhere from 4.5 to 7 miles off of Muscle Rock in San Francisco Bay, found isn’t rare. In fact, he’s just another citizen who has witnessed a rapidly growing marine plague known as starfish wasting disease. Since late summer of 2013, starfish of all kinds from Encinitas, Calif., to the shores of Alaska have been literally melting away in kelp beds and tide pools. While the cause of these symptoms is unknown, scientists are investigating the pathogens infecting the starfish and the reasons they are becoming susceptible to the infections, at all. “One thing to remember is it’s not a single disease, it’s a series of symptoms.The visual symptoms are that the starfish gets a wound or lesion and then eventually melts or dissolves,” said Pete Raimondi, professor and chair for UC Santa Cruz’s Department of Ecology and Evolutionary Biology. “There have been previous events but this is the biggest,” he added. In 1977 and 1978, starfish wasting disease was caused by El Niño which warmed the waters of Southern California and Mexico. But this time around, the disease has spread along the entire coast.Water temperatures are normal and scientists cannot pinpoint a cause. A secondary question is just how many starfish have fallen victim to the disease? Some starfish species, like the bat star and the leather star are less susceptible to the disease, which is likely due to their heartiness, Raimondi noted. 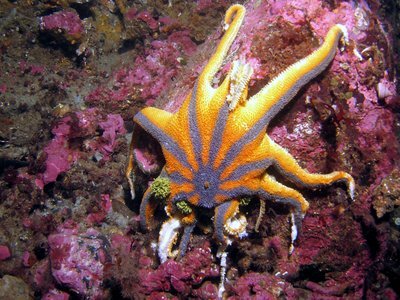 Other species, like the giant sunflower star are far more susceptible, as their bodies are far more flimsy and less structured. Raimondi, other researchers and citizen scientists have witnessed the disease everywhere on the West Coast, but most heavily in the northwest (Alaska, Vancouver), Monterey Bay and Southern California. In Monterey, where Raimondi often takes students scuba diving, entire species of starfish appear to have gone extinct, he said. What isn’t clear is how many starfish are dying off in more isolated and less frequented areas. Researchers will be sent to the Channel Islands, Big Sur coast and North Central coast (north of San Francisco). The goal for Raimondi and scientists is to figure out the cause of the plague, where it is now and where it is spreading. Part of the problem is that scientists are trying to isolate the pathogen but don’t have any samples from offshore to compare to the shallow water specimen, he explained. All samples have been from shore or kelp forests at maybe 80 or 90 feet deep. Within a matter of days, Tavasieff, who met Raimondi through a series of Marine Life Protection Acts initiative meetings, could change that. Tavasieff, who has witnessed the diseased starfish farther offshore than citizen scientists have, will have his eye out for any starfish including the pink sea star, brown sea star and giant sunstar. Should the fishermen successfully catch any starfish, he’ll send them to Raimondi in Santa Cruz in a preserving container, giving biologists the chance to learn more about what’s causing this disease. Eventually, the sample will likely end up in the hands of Ian Hewson, a microbiologist at Cornell University who has been investigating potential pathogens that are affecting star fish around the coast for the last four months. By studying and comparing pathogen DNA found from more than 250 starfish, from San Diego to Vancouver, Hewson and fellow microbiologists have found several common symptoms. Now they just need to narrow it down. Among the effects that starfish die off could cause will include anoxia, overly abundant prey such as mussels and clams, and easy meals for predators such as seagulls.